Hooray for end of the week! 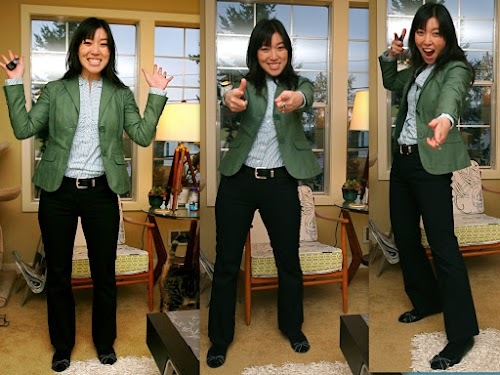 My silly poses continued, and I realized that the poses made me really cheerful. It's incredibly hard to smile and act silly and NOT get happy (at least for me). Cindi once asked me how I look so relaxed in pics. 1) lol, I don't think I always look so relaxed, but I'm glad it appears that way. And, 2) I suspect my laid back demeanor is due to my goofiness. I honestly laugh at myself A LOT during photo-taking, and it probably helps me relax. It's embodied cognition in action. Researchers have shown that smiling or even doing tasks that make you smile (like holding a pencil between your teeth) make you rate see things more positively. 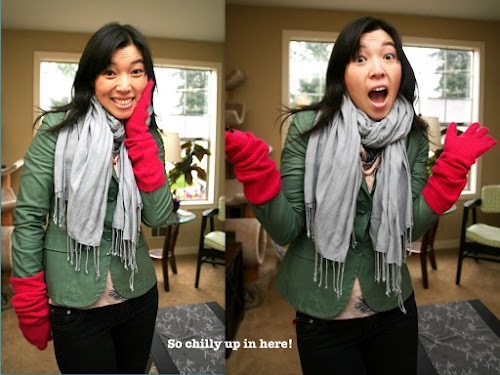 So my OOTD pic taking is very functional for me - smiling and acting silly gives me a more positive perspective on life! And you can see I really took advantage of embodied cognition at the end of the week. The On-a-wing blouse is the first top I ever bought from Anthro. I saw it in the catalog, but couldn't afford to pay full price. And one day, I went into Anthro and they had a size 6 on the sales rack! It was missing some buttons (probably due to all the frustrated shoppers having to button and unbutton all its buttons), so I also got a damage discount. But the employees were also able to find buttons that had fallen on the floors of the dressing rooms, so I just sewed those on when I got home. Voilá! I actually love the buttons down the side, and I don't have difficulty with them. I also love the delicate stitched navy feathers and airy pink voluminous fabric. 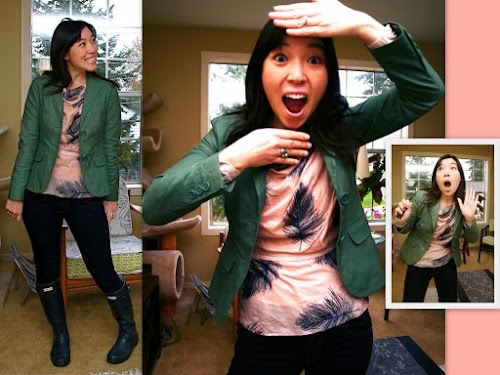 Of course a feminine pink top such as this paired nicely with a more masculine olive green blazer! They balance each other out. And here I am, at the end of the week, after finishing my presentation. It really was quite gratifying sharing my research with the broader area. Look at the elation! I realize looking at the pics, that this looks A LOT like my Wed outfit. But the only thing consistent between the two is the blazer! I think it's because the skinny jeans on Wednesday photograph so dark they look black rather than deep indigo. I really don't have enough black shoes. There weren't many options to wear with these black slacks. I didn't want to wear heels while presenting. And the huge black boots I just bought aren't professional enough to present in. These bow shoes have only the smallest of wedges. I tried to pretend they weren't peep-toe by wearing black socks. um. yah. I'm totes sneaky like that. Tungsten photo bombed my pic this time. I had just gotten home, and he was pretty insistent on knowing why I wasn't feeding him, like right then! Here's a close-up of the button-up. I love it because it's got a different neckline than typical button-ups and the pleating gives it visual interest. But, the color scheme still keeps it looking fairly mainstream and professional. Plus, it is SO soft and smooth. You look all rugged up in the first outfit, and glad you got a discount on the blouse. erm, Lori did you change the commenting section of your blog? I LOVE IT!! Did you change the commenting section for me? Thank you! Now I can see all the images as well as read your descriptions and not have to rely on my faulty memory. Wed OOTD - Surprising mix of colors. different, but I am loving it. Almost a muted holiday color palette. Was this also your very first Anthro piece? I love how you took the Blue from the On The Wings Blouse and translated it to your boots. Wonderful outfit! Thurs OOTD - Ha-ha! I like your Kickin' It At Home Oufit. Fun pattern mix. You make Stripes and florals look easy to mix. Is there a secret to getting this pattern mix to work? Or is it more try, try again like I have to do? Friday - This is low key for you, but perfect for winding down a tough week. Thanks for the invisible peep toe trick. Very clever girl. I LOVE all your outfits...LOVE stripes!! But onto your amazing outfit: I really like how you used the more masculine blazer to counter the "flowiness" of the On-a-wing blouse. I also like the way that your wore your Ebay snafu cardigan over the lightweight striped sweater. I almost never thing to layer sweaters over/under other sweaters. And the neckline of your BCBG blouse is indeed gorgeous. I have a white BCBG blouse and the fabric is similarly soft. It's one of my favorite blouses of all time. Hi Lori! 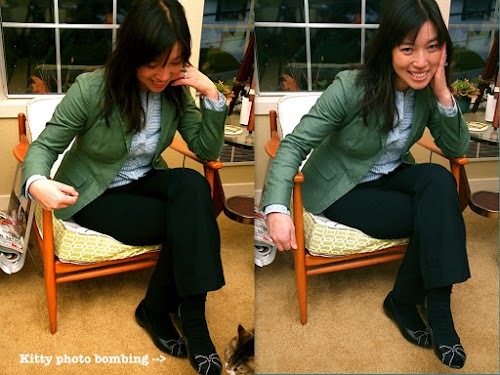 The on-a-wing blouse is such a fantastic piece, and I think how you paired it with the blazer is a great touch. You really do look so comfortable in your photos, I need to practice that I think, so major kudos to you! I love that anthro top! It always feels great to get a good bargain like that, especially when you have a gift card to boot! 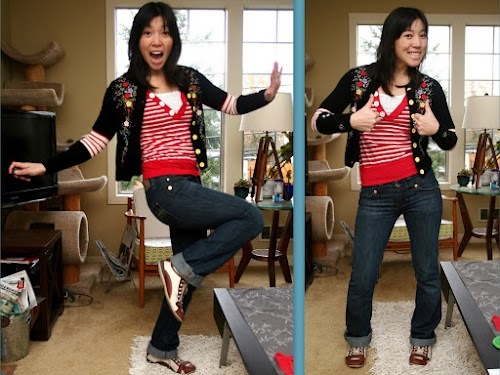 Lori, love the outfits, especially the red stripe tee and cardi with the cool Merrill shoes! And I love the chair in your pics- did you thrift it? I'm on the lookout for one! Love your Wednesday outfit. I just recently got into fashion and I'm not too sure about how to dress well in the cold weather. You've given me great ideas with layering shirts, blazers and scarves! @vintageglammz No you are not as stiff as a surfboard! I love your pics! You always look effortless and romantic! and I did change the commenting section! @Laura yes! you totes inspired the commenting change. I didn't even realize I could change the formatting. You inspired me to look at the options :) I think my very first anthro piece was a tank that my hubby bought me for our anniversary, but it's too big for me now so I can't even wear it. :( No secret to pattern mixing for me. I still don't get pattern mixing right most of the time. I just like to play with things and sometimes they work. @Peggy yup, chair was thrifted. We found it at a garage sale for $25. I made a quick and dirty new zippered seat covers, but I'm still looking for the right fabric to eventually cover it in. We also see these chairs pop up on craigslist, but normally for more $$.